One day the Andromeda galaxy will collide with ours. What if it was deliberate? What if the impending collision has been speeded up, so that it will threaten the whole civilisation in the Milky Way and destroy them all? What will the Council of Worlds do to prevent this happening? If the Kresh and the Gnathe have been travelling back in time to rescue alien civilizations from the deliberate destabilisation of their stars, before the Harvester can feed on the extinguished life force, an ancient enemy has been formed! To combat this menace, a search through time is instigated to find those who waged war against the Goss. The galactic civilization of the Milky Way move stars and worlds into a globular cluster and launches it towards the greater Magellanic cloud to escape the impact of the galaxies leaving the time-fished aliens to face the Harvester. Link-soo-shan gets involved with genetically engineering a new type of human being that can see into the future. 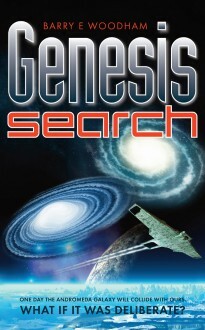 Kamiel sends an expedition composed of useful aliens, to the Andromeda galaxy to free the intelligent species living there from the yoke of the Harvester. In doing this he creates potential world minds and in doing so, he creates a galactic society bound by the telepathic abilities of the Goss that can control wormholes. In time he launches an armada of Toarvaks against the energy being that feeds off the life force of sapient species.